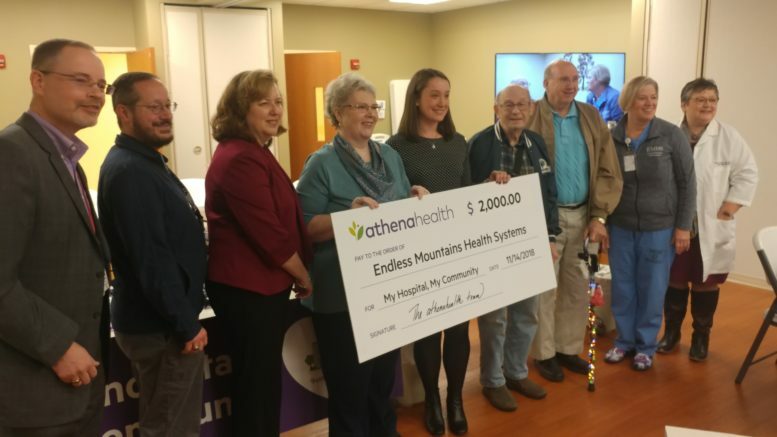 The Endless Mountains Heath Systems of Montrose has won a $2,000 cash award as part of a national “My Hospital, My Community” Contest sponsored by health care provider athenahealth. The “My Hospital, My Community” contest targets rural health care providers by encouraging entrants to share stories about what makes their local community hospitals special. Contestants sent in videos, e-mails and letters. The contest is in its second year. “It’s really important to continue keeping critical access hospitals in place because of their importance and I’m honored to be with you here today,” said Laura Aswad, the athenahealth senior sales manager who last week traveled here to Montrose to present EMHS with its $2,000 check. EMHS was chosen after its entry was selected from a total of over 700 entries from almost 100 hospitals. “This is truly recognizing what community hospitals do because they certainly have no financial relationship with us, but they care about the work that we do and they focus on small communities,” EMHS CEO Loren Stone told the audience. In her winning story, Marian Dreimann, now a LPN at EMHS, credited EMHS with having saved her husband Kirk’s life on three separate occasions starting in 1996. The third, and perhaps most serious time, came in 2008 when Kirk, by then a 53-year-old, suffered a severe aneurysm. “My husband was only 53 years old and it seemed he would not be around tomorrow,” Dreimann’s story continued. At first they were unable to find a hospital to accept Kirk because of the severity of his condition. “Three hospitals had refused him, stating: Do not waste the resources, he is going to die. Make him comfortable,” Dreimann wrote. Nonetheless, the EMHS staff kept working until they found a hospital which would accept him. They eventually succeeded. “One month later, after 19 hours of surgery, a coma, and multiple strokes and loss of his right side, our little hospital welcomed my husband back home. When the ambulance brought him home, our wonderful staff was lined up in the halls to welcome him. My husband had no idea what he had been through. He believed he had just slept for 24 hours, not one month,” Dreimann wrote. The Dreimanns then had a tearful hospital bedside reunion with their family physician. “The doctor cried, he admitted he never expected to see him again. It was definitely a miracle. Just one of the many that has happened at our little hospital,” Dreimann’s story ended. EMHS is Montrose’s 25-bed, non-profit, acute care hospital with emergency services and physician offices which each year see an average of 1,000 admissions, 42,200 office visits and 7,500 emergencies. Massachusetts-based athenahealth provides Internet-based administrative solutions to over 120,000 health care providers serving 117 million patients. Be the first to comment on "Community at heart of EMHS award"